This is an all original 32mm. 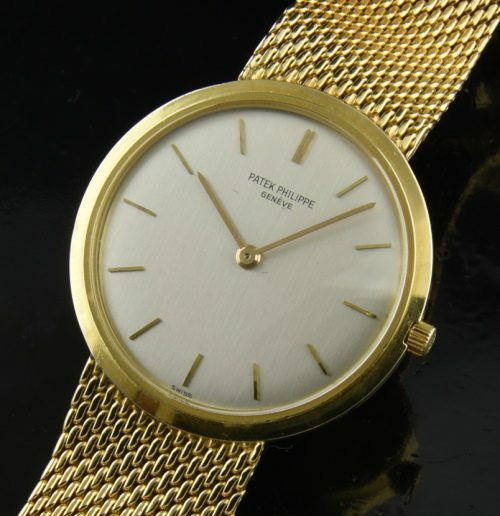 circa 1980’s Patek Philippe reference 3520 having a solid gold integrated PATEK PHILIPPE bracelet with buckle. The dial, hands, case and winding crown are all original. The very fine manual winding movement by PATEK PHILIPPE was recently cleaned and is accurately keeping time. This is a very clean watch overall-no kinks in the bracelet and no dings on the case. This Patek is thin and discreet at only 4.75mm. thin. We are pricing this superb watch to sell.